Keywords: Signs and Symptoms. Disclosure. Rehabilitation. Stigma and discrimination are universal among patients with psychiatric disorders irrespective of the disorder. Stigma can be in the form of public, interpersonal, perceived, experienced, and self-stigma. Stigma held by public against persons with mental illness is called public stigma which results in stigma in interpersonal interactions between stigmatised and stigmatising groups, called interpersonal stigma. Self-stigma is defined as “subjective negative feelings and behaviour and stereotype endorsement regarding self which results from experiences, perceptions, or anticipation of negative social reactions”. According to social cognitive models of stigma, stigma develops when persons hold negative stereotypes regarding mental illness. These stereotypes result in prejudice which further lead to discrimination. Self-stigma develops because persons have endorsed stereotypes related to mental illness before they suffer from mental illness. These stereotypes become relevant to self and lead to self-stigma once a person develops mental illness. Majority of stigma research has been conducted in schizophrenia and bipolar disorder. [1,2] Self-stigma among patients with depression is not well-studied. It has been estimated that about one-third to half of the patients with mental disorders experience high levels of self-stigma. A recent Indian study found that self-stigma was highly prevalent among patients with first episode depression. Another multicentre study from India revealed that patients with recurrent depression experienced lower level of stigma as compared to schizophrenia and bipolar disorder. Stigma diminishes hope, self-esteem, self-efficacy, empowerment, and quality of life of persons with mental disorder and is a major barrier to seeking treatment. It leads to difficulty in finding employment, housing and leads to social isolation and exclusion. A previous Indian study found that patients with depression suffered from stigma, though stigma among patients with depression was lesser than schizophrenia and substance disorders. The aim of the present study was to assess self-stigma and its correlates among patients with depression since self-stigma is not very well-studied and it can have a profound impact on quality of life and other aspects of patient’s lives. A cross-sectional study was conducted in the Outpatient Department (OPD) of Psychiatry of Government Medical College and Rajindra Hospital, Patiala, North India in August and September 2018. One hundred and fifty consecutive patients suffering from depression as per the fifth edition of the Diagnostic and Statistical Manual of Mental Disorders (DSM-5) were recruited. Patients were included if they were more than 18 years old, accompanied by reliable informants, were willing to participate in the study, and in symptomatic remission. Patients were excluded if they had comorbid substance use disorder, physical, medical, neurological, or orthopaedic disorder that could affect stigma. Patients who refused to give written informed consent were excluded from the study. All the patients attending the psychiatry OPD were screened by the researchers. The patients fulfilling inclusion and exclusion criteria were invited to participate in the study and written informed consent was obtained. About 30-35 minutes were taken to assess each patient. A semi-structured proforma to record sociodemographic and clinical parameters was applied followed by the Hindi Stigma Scale. It is a 28-item Likert-type scale (agree, neither agree nor disagree, and disagree). Each item is rated from zero to two. The 28 items are divided into three domains, namely discrimination (13 items), disclosure (ten items), and positive aspects of stigma (five items). Higher score denotes higher stigma. The scale measures patient’s actual stigmatising experiences and the cognitive, affective, and behavioural responses to stigma. The scale has been previously standardised in India among 218 patients with various psychiatric disorders. The internal consistency was found to be 0.840 and test retest reliability was 0.913. All the ethical guidelines were adhered to. The study was approved by ethics committee of the institute. Written informed consent was taken from all the patients. The Indian Council of Medical Research ethical guidelines for biomedical research on human participants were adhered to. Analysis was conducted using IBM SPSS Statistics (version 22.0). For normally distributed data, means of more than two subgroups were compared using one-way ANOVA followed by post-hoc multiple comparisons test. For skewed data, Kruskal-Wallis test followed by Mann-Whitney test for two groups was applied. Spearman or Pearson correlation coefficients were calculated to see relationship of different variables with stigma. All the statistical tests were two-sided and were performed at a significance level of α=0.05. The sample for the study comprised of 150 patients with depression. 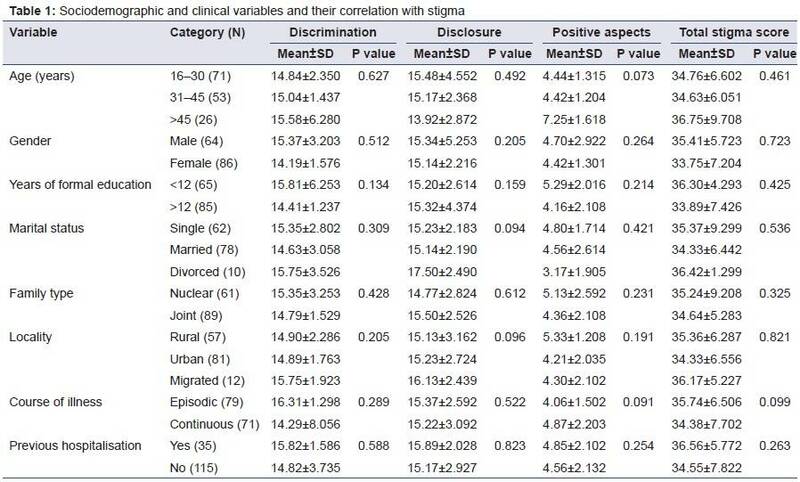 Table 1 shows sociodemographic and clinical parameters of participants and their correlation with stigma. Majority of the patients were females (57.33%; N=86), of in the young age group (47.33%; N=71), and had more than 12 years of formal education (56.67%; N=85). Most of the patients were married (52%; N=78) and hailed from urban locality (54%; N=81) and joint families (59.33%; N=89). The mean duration of illness was 43.46±22.503 months (range two to 180) and majority of the patients were never hospitalised. Total stigma or any of the domains of stigma were not significantly affected by any sociodemographic variable. However, it was observed that total stigma (correlation coefficient=0.403; sig. 2 tailed 0.023) and discrimination (correlation coefficient=0.392; sig. 2 tailed .007) were significantly positively correlated with duration of illness. Mean stigma scale score of 150 patients was 34.76±7.650 (range= eight to 50) (Table 2). Thus, the score was 60% of maximum possible score of 56. The scores on the discrimination, disclosure, and positive aspects domains were 14.17±3.521 (nearly 55% of the maximum possible score of 26), 15.01±2.523 (more than 75% of the maximum possible score of 20), and 5.58±1.253 (about 50% of the maximum possible score of ten) respectively. On item-wise analysis of stigma scale, it was observed that majority of the patients did not want to disclose their psychiatric illness or its treatment to general public (73%; N=110), friends (49%; N=73), neighbours (58%; N=87), or in job applications (63%; N=95). Majority of the patients were concerned about negative reactions of others if the mental illness was disclosed. Nearly 50% (N=74) patients reported that people avoided or insulted them because of their mental illness. Eighty per cent (N=120) patients felt bad and 70% (N=105) felt ashamed for having a mental illness. Seventy five per cent (N=112) patients felt lonely or angry because of people’s reactions to their mental illness. Eighty three per cent (N=124) patients felt that they would have got better opportunities in life had it not for their mental illness. Overt discrimination was reported by 18% (N=27) in education, 22% (N=33) in employment, five per cent (N=eight) by police, and four per cent (N=six) by doctors. The present study explores stigma and discrimination experienced by patients suffering from depression. The score of total stigma and subscales show that patients suffer from moderate to high level of stigma, particularly related to disclosure of illness. Persons with depression anticipate higher stigma and discrimination than what they actually experience. Stigma was not found to be significantly affected by any sociodemographic variables. This suggests that stigma is an integral part of living with depression. Literature in other psychiatric disorders have also reported that there is no consistent association of stigma with sociodemographic characteristics. The present study found that total stigma and stigma related to discrimination increase with increasing duration of illness. Another Indian study has reported that longer duration of depressive episode is associated with higher stigma. Longer duration of illness may lead to difficulties in employment and other opportunities which might explain these findings. It was found that 22% patients had experienced discrimination in employment and more than 60% did not disclose their mental illness in job applications because they anticipated stigma. The findings are in consonance with a multinational study done in 35 countries to assess discrimination in the workplace experienced by patients with depression. The multinational study also reported that patients anticipated higher discrimination than what they actually experience at the workplace. These findings clearly support the need of interventions to reduce stigma and discrimination at the workplace. Majority of the patients endorsed that they would have got better chances in life had it not been for their mental illness. This could be explained on the basis of ‘why try’ effect. Persons with mental illness endorse and apply stereotypes to self and suffer from internalisation of stigma. This leads to reduced self-esteem and self-efficacy, and lack of pursuing life goals. In the present study, previous hospitalisation did not affect stigma. A previous study among patients with mental illness revealed that patients who received full time hospitalisation received higher stigma and social rejection that patients receiving part time hospitalisation. The possible explanation could be that patients who undergo hospitalisation are considered sicker by the society and by themselves, are not able to fulfil their social and family obligations. As the number of patients who were previously hospitalised is too less in the present study as compared to those who were never hospitalised, it is difficult to draw any conclusion on this issue. The findings of the present study reiterate the findings of the previous studies which reveal that stigma is universal in mental illness regardless of the type of diagnosis. Stigma reduction should be a major component of management and rehabilitation of persons with mental illness so that they can perform their personal, social, and family roles and live their lives to the fullest. A number of stigma reduction initiatives have been suggested. The three major strategies to reduce public stigma related to mental illness are education, protest, and contact. To reduce self-stigma, the major strategy suggested is psychoeducation and cognitive restructuring. Small sample size and cross-sectional design of the study are the notable limitations. The authors also did not apply any scale to measure the severity of depression. As this is a hospital-based study, the findings cannot be generalised to the population. Patients with depression suffer from a moderate to high degree of stigma. They hide the illness from friends, neighbours, employers, and general public. Patients anticipate high stigma even in the absence of overt discrimination. Stigma leads to a range of negative emotional, behavioural, and cognitive reactions. It reduced self-esteem, quality of life, hope, and ultimately, causes social exclusion and isolation from the mainstream culture. Arun P, Garg R. Stigma of mental illness. In: Chadda RK, Kumar V, Sarkar S, editors. Social psychiatry: principles and clinical perspectives. New Delhi: Jaypee Publishers; 2018:409-25. Livingston JD, Boyd JE. Correlates and consequences of internalized stigma for people living with mental illness: a systematic review and meta-analysis. Soc Sci Med. 2010;71:2150-61. Sahoo S, Grover S, Malhotra R, Avasthi A. Internalized stigma experienced by patients with first-episode depression: a study from a tertiary care center. Indian J Soc Psychiatry. 2018;34:21-9. Grover S, Avasthi A, Singh A, Dan A, Neogi R, Kaur D, et al. Stigma experienced by patients with severe mental disorders: a nationwide multicentric study from India. Psychiatry Res. 2017;257:550-558. Garg R, Chavan BS, Arun P. Stigma and discrimination: how do persons with psychiatric disorders and substance dependence view themselves? Indian J Soc Psychiatry. 2012;28:121-30. Garg R, Arun P, Chavan BS. Reliability of the stigma scale in the Indian setting. Indian J Soc Res. 2013;54:267-75. Indian Council of Medical Research. Ethical guidelines for biomedical research on human participants. New Delhi: Indian Council of Medical Research; 2008. Corrigan PW, Kosyluk KA, Rüsch N. Reducing self-stigma by coming out proud. Am J Public Health. 2013;103:794-800. Lysaker PH, Yanos PT, Outcalt J, Roe D. Association of stigma, self-esteem, and symptoms with concurrent and prospective assessment of social anxiety in schizophrenia. Clin Schizophr Relat Psychoses. 2010;4:41-8. Rüsch N, Corrigan PW, Powell K, Rajah A, Olschewski M, Wilkniss S, et al. A stress-coping model of mental illness stigma: II. Emotional stress responses, coping behavior and outcome. Schizophr Res. 2009;110:65-71. Rüsch N, Corrigan PW, Wassel A, Michaels P, Olschewski M, Wilkniss S, et al. A stress-coping model of mental illness stigma: I. Predictors of cognitive stress appraisal. Schizophr Res. 2009;110:59-64. Brouwers EP, Mathijssen J, Van Bortel T, Knifton L, Wahlbeck K, Van Audenhove C, et al. ; ASPEN/INDIGO Study Group. Discrimination in the workplace, reported by people with major depressive disorder: a cross-sectional study in 35 countries. BMJ Open. 2016;6:e009961. Verhaeghe M, Bracke P, Christiaens W. Part-time hospitalisation and stigma experiences: a study in contemporary psychiatric hospitals. BMC Health Serv Res. 2008;8:125.